The contaminated iron plate is an annoying issue, whether you have burned a garment and there is debris on the coating, or over time has formed deposits of solid water. When the flat portion of the iron is not completely clean, the risk of staining, or even worse, burn the garment that the ironing increases. That’s why we’ve chosen the most effective methods for quickly and easily cleaning household iron with environmental and handy materials. These spots are tedious and seem difficult to remove, but you can handle them with handy materials you have at home. Heat the iron to the highest temperature. Put a clean, dry cloth on the ironing table on it – a newspaper. Smooth the paper with the heated iron. Spread it several times and the hard cloth of cloth will fall. You can also use a paper handkerchief. Heat the iron lightly and then turn it off – it should be so hot that you can touch it without burning. Take a piece of cotton cloth, soak it in vinegar and rub the stain of the burned. This method requires a little more time, but it is suitable for cleaning the iron plate without the risk of scratching. Heat the iron at the highest temperature. Pour a dry cloth over the ironing table and sprinkle it with sea salt. Pass the iron over the salt several times until the burnt spot falls. 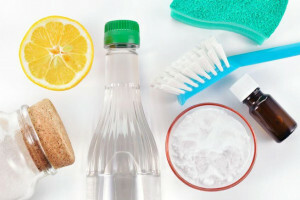 Prepare a thick paste of two to three tablespoons of soda bicarbonate and very little water. Lubricate the cold iron plate with the mixture. Using a cotton cloth or cloth, gently scrub the stain with light circular movements. After this peculiar peeling of the spot, there will be no trace. If you do not want to use abrasive substances such as salt or soda, try to remove the burned surface from the iron with the help of dishwashing solution. Immerse a clean cloth in a warm water bowl in which 1 tablespoon of dishwashing solution is dissolved. Remove the cloth without squeezing it and put it in a flat basin put the iron on the cloth and let it soak for a few hours. Wash the plate with warm water and the soft side of the sponge for dishes to avoid scratching it. If the stains on the surface are not as old, you can use a solution of ammonia and a small cloth. Once the iron is clean, rinse with a clean cloth moistened with water. If the iron plate is not slipping on your clothes as easily as when it was new, try these easy polishing tricks that are used to clean silver. Lubricate the cold iron with a toothpaste and leave it for 1-2 minutes. Use plain, non-gel or abrasive paste. Take a cotton cloth, polish the metal surface with circular movements and rinse. Turn on the iron to the highest level and drop the steam so that if there is a paste remaining in the steam holes, go out. Spray the cold iron with a window cleaner and wipe the surface with a cotton cloth. If there are deposits around the vents, immerse the eyelet in a baking soda and water paste and gently clean the holes. Rinse with water, warm the iron, and let the steam go. If you have not steamed for a while and forgot to express the water tank, a slight smell of mould may appear. To remove it, dilute a white vinegar in a distilled water in a 1: 1 ratio and pour into the reservoir. Heat the iron at the highest temperature and press the steam button until the mixture evaporates. Rinse by pouring clean distilled water and let the steam work again until it evaporates. Important: When cleaning the iron plate, use only soft cloths and sponges to avoid scratching the surface. Never clean a Teflon coated iron with abrasives. 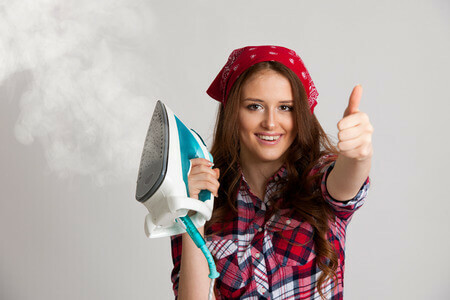 At last but not least, every housewife should not forget to read the instructions for operating the iron, because they are the best way to prevent unpleasant stains on clothes after ironing. For any of your professional cleaning services call today Royal Cleaners on 020 3637 8979.